Please help us assist the family of Corey By donating whatever you can to offset the cost of funeral arrangements. we appreciate whatever you can give and thank you in advance. May God watch over you in your time of sorrow and help you with your loss. 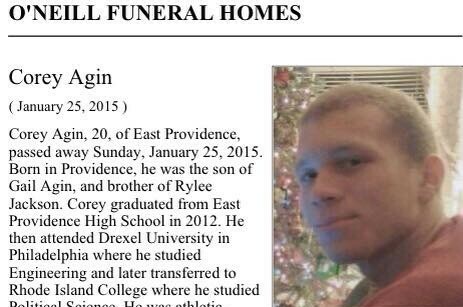 Corey was a great kid, always polite and kind to others. He will be missed by so many, especially by our daughter Hannah. She thought the world of him. Our thoughts and prayers are with you all. My thoughts and prayers are with you Gail and Corey's family and friends. We are deeply saddened by the loss of Corey. My condolences to the friends and family of Corey, he will be missed.